Machining - lathes, mills, etc. This page includes various charts useful to machining. Additional charts will be added to this page as time permits. All charts will be provided in both editable and PDF formats. Editable formats will be ODF (Open Document Format) as provided by LibreOffice. This chart (and spreadsheet) provides coordinates for drilling holes for the purpose of milling angle plates for a precise number of degrees. In addition, the spreadsheet enables the calculation of additional angles not listed in the chart. 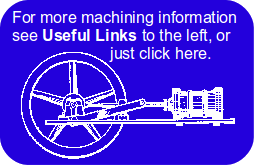 For an example of how this chart is used to make angle plates, see the Angle Plate link on this website. This spreadsheet calculates the X, Y coordinates for a specified number of bolt holes in a circle of specified radius; the resulting table can be printed out for use at the workbench. As noted above, this spreadsheet is for LibreOffice Calc; it will probably work in Excel, but this has not been tested. Updated 7-26-2018 to support metric entries and results. Updated 7-27-2018 to include Google Sheets version; this can be used online. This version also creates a diagram showing bolt hole locations. This chart is intended to provide all of the commonly used fractions from 1/64 to 1 by 64ths, while at the same time providing improved readability. Decimal equivalents are provided to four decimal places. Since typically only three decimal places are used, the fourth decimal place is included in a reduced font size so that the first three decimal places may be more easily read. The site page on Spring Making includes links to a spreadsheet for calculating mandrel sizes for spring winding, as well as calculations for duplicating a spring using different spring wire types, etc. This spreadsheet enables the calculation of the amount of thermal expansion in a material with change in temperature. The spreadsheet enables the selection of material type (iron, aluminum, etc. ), the initial length (in mm or inches) and the starting and ending temperature (°F or °C). This spreadsheet was created in LibreOffice and saved to the two formats below; the spreadsheet has not been tested in Excel. COMMENTS: To leave comments about this site, please visit the home page.